ScotiaBank Pro-Am media day. Photo by Roger Hallett. Back in May I got the opportunity to help out for the ScotiaBank Pro-Am media day at St. Mike’s Arena. 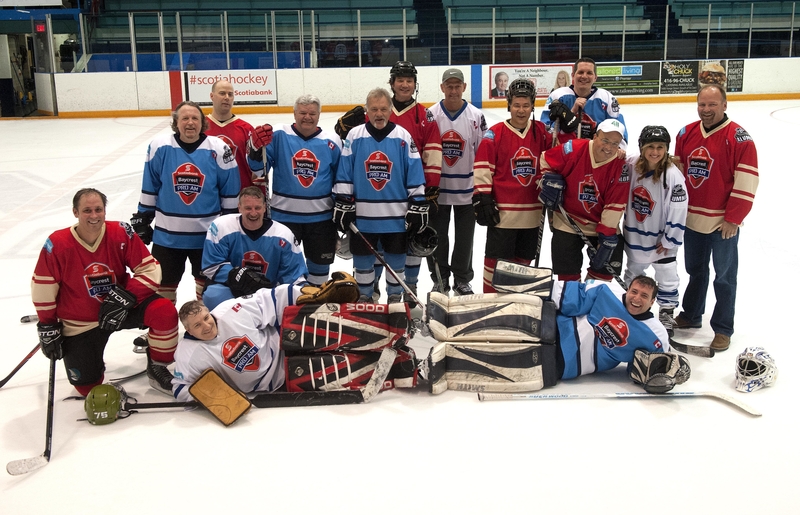 My job was pretty simple: according to organizer and charity hockey ninja Rob Weir I was to sit in the net and let random dudes take shots on me for an hour or two while TV cameras came by to shoot b-roll and do interviews. The kicker: former NHL greats Marcel Dionne (1,348 gp, 1,771 pts, 2 Lady Byngs, 2 Lester B. Pearsons, 1 Art Ross), Dennis Maruk (888 gp, 878 pts) and Mike Krushelnyski (897 gp, 569 pts, 3 Stanley Cups as a player, 1 as an assistant coach) were among the shooters. 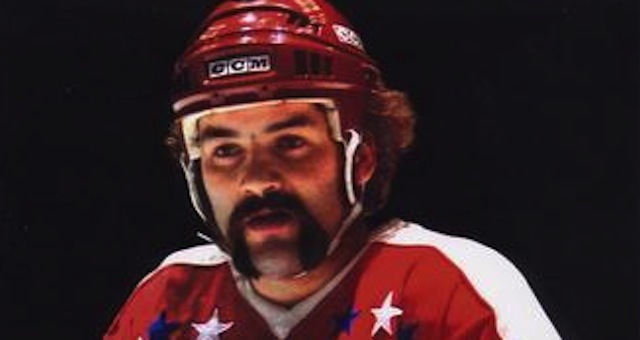 So I was going to get to face an NHL scoring champ, a Stanley Cup winner and a dude with one of the best moustache games in hockey history. We did a number of breakaways, 2-on-1s and lots of just shooting the puck around before getting down to some actual shinny. My team, the reds, would take Krushelnyski — who’s listed as 6’2, but looks way bigger on the ice — Matt Sharron from frienemies the Sgt. Rock hockey club as well as some of the Pro-Am’s high earners/media friends who were invited out for a skate. On the other side were Weir, Sgt. Rock ‘tender Ron Fine, some Pro-Am friends and Dionne and Maruk. I would be facing 2,649 NHL points. With the exception of that one time in 2011 when I did one of these media days for the Juno Awards back in 2011 and ex-Leaf Gary Leeman ruthlessly lit me up all game, most of the time the pros dial it down to about 35% of their actual ability during these things. So it was relatively easy to track that when Maruk would come blasting down the right side (dude still has legs for a 58 year old) he’d usually pull up and attempt to set up one of the amateurs once he got to scoring territory. The amateurs, being amateurs, and being panicky dudes who were getting set up by ex-pros were pretty much uniformly heaving middling one-timer ops straight into my gut. They made me look good, but weren’t terribly dangerous. Dionne, for his part, wasn’t the biggest threat either. His 63 years on this planet have clearly weighed heavily on his 5’8 frame. Perhaps it’s got something to do with his stake in the charming Blueline Diner (which also has an amazing memorabilia shop), but the two or three scoring chances Dionne took were uneven at best. He missed the net a couple times and wasn’t really dangerous. Maruk, on the other hand, still has it. He was buzzing the whole scrimmage and threw down exactly like you’d expect from a guy who once scored 136 points in a single season. And sneaky, too. Those aforementioned set-ups? Those were masterful passes he was laying down to the other players. But Maruk wasn’t taking many shots himself. That was until he decided to go for it on one rush. Whether it was a self-imposed no-headhunt/top cheese sniping rule, or because it’s a darn sneaky play, Maruk blasted his slapshot right along the ice, pinpoint perfect towards the five-hole gap I was leaving as I dropped down into butterfly to make the save. The man knew exactly what he was doing with his placement. The puck hit my stick with such force that the rubber almost forced itself through the blade by sheer willpower. But I got just enough of it that by the time I landed in butterfly the puck ended up somewhere under my legs. I stopped Dennis Maruk on a fast, hard slapshot.